Panama City Beach's newest and finest seafood buffet is housed in a charming and unusual historic building on Thomas Drive. Hosted by renown local restauranteur, Jack Bishop, and an experienced crew that has been serving Panama City Beach since 1971. 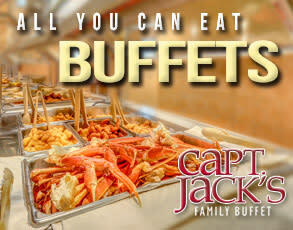 Two amazing buffets daily: LUNCH BUFFET served 11am-2pm, includes: Deviled Crab, Hushpuppies, Fried, Baked & Grilled Fish, an amazing 38 item Salad Bar, Fresh Vegetables, Veal Parmesan, Chicken, Country Steak-n-Gravy, Mashed Potatoes, Spaghetti, Daily Chef Specials, Homemade Desserts & Ice Cream. 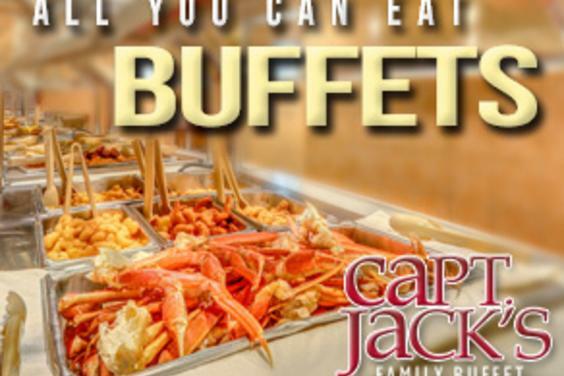 DINNER BUFFET, served 3:30pm-till, includes: #1 Crab Legs, Broiled Shrimp, Fish of the Day, Scallops, Crawfish (when in season), Roast Beef, Popcorn Shrimp, Veal Parmesan, Chicken, Country Steak-n-Gravy, Mashed Potatoes, Spaghetti, Fried, Baked & Grilled Fish, Deviled Crab, Hushpuppies, Nightly Chef Creations, Fresh 38 Item Salad Bar, Fresh Veggies & more. Truly, the best family value on the beach.